Due to league relatives passing away, new pregnancies and league transitions, our Ladies of Capone and Sailor Marys asked [local men’s league] Uinta Madness if they would be willing to be thrown into the mix for this bout to fill the skates of girls who are on leave. With a different lineup and the Capones main Jammer Smashleigh on leave, the Capones and Marys were unsure of what the outcome would be. The Sailors dominated the first half by blocking the Capones jammers nonstop. The Capones fought hard to get their defense intact, but were constantly sunk by the Sailors. Halftime score: Sailor Marys 106, Ladies of Capone 50. The second half mirrored the first half with the Sailor Marys (and Jerrys) racking up some serious points in power jams and defense. The Ladies of Capone (and Capones) bringing their best to the floor was only blocked when the top jammer on the Capones, Pickle, fouled out of the game. Followed by Ankle Breaker of Uinta Madness (who also played in the halftime scrimmage) living up to his name, leaving the bout with an ankle injury. Sailors went down a team member as well when Major P.I.T.A of Uinta Madness was removed from the bout for fouling out. Final score: Sailor Marys 265, Ladies of Capone 88. 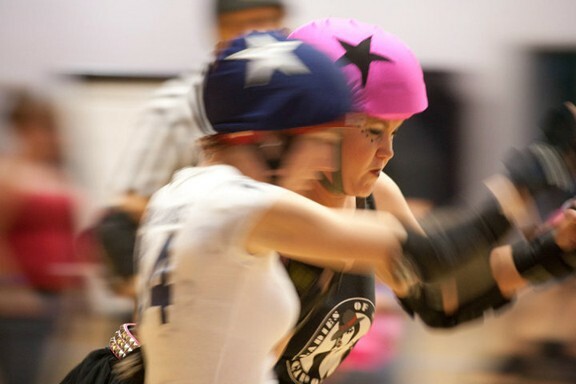 The bout was fun! We had a great time playing with the men’s league and can't wait to play against them next season. Our fans are amazing for sitting in the "sauna," as we refer to Marshall White Center since their A/C broke in May—hopefully to be fixed by the next bout! We would like to extend a thank-you to the Utah Derby Officials (UDOG), Wasatch Roller Derby, Junction City Dolls and refs, Uinta Madness, and fabulous Salt City Derby Girls announcers Johnny Crass and Lulu Garou, who were amazing as usual. Next bout, O-Town travel team 25th St. Brawlers take on Prescott Arizona's Northern Arizona Roller Derby on Saturday, Sept. 11 at Marshall White. Doors open at 6 pm, bout starts at 7 pm. Tickets available at OTownDerbyDames.com; $10 in advance, $12 at the door. In honor of 9/11, we are offering $8 tickets to active/retired Police, Firefighters and Military. Please see an O-Town Derby Dame or present your I.D. at the door!